UPDATE – Look for David Watson’s latest Cardinalfish breeding story, featuring the Bluestreak or Threadfin Cardinal (Zoramia leptacantha) in the January/February 2016 issue of CORAL. One of the most exciting stories in the next issue of CORAL Magazine is that of David Watson’s at-home breeding success with the Red-stripe Cardinalfish, Ostorhinchus margaritophorus (syn. Apogon margaritophorus) in Madison, Wisconsin. Watson’s success with the species came right around the same time as the success of large-scale commercial producer Sustainable Aquatics, making it difficult to determine who was first to rear the species. Either way, this isn’t Watson’s first unusual at home marine fish breeding success, and hopefully isn’t his last. 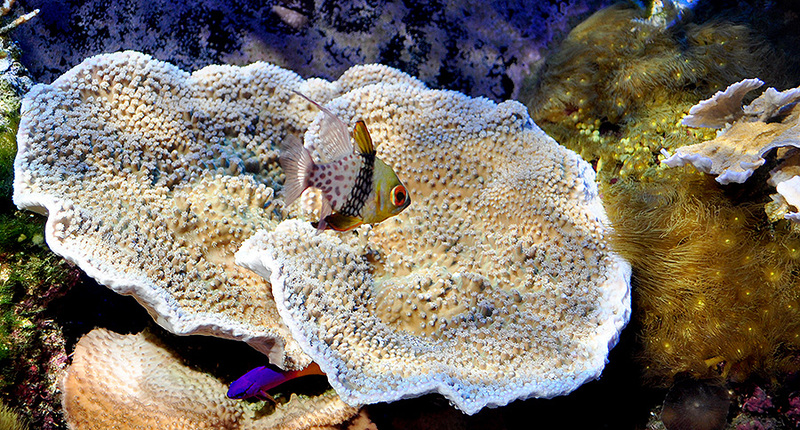 CORAL and Reef2Rainforest.com Editor Matt Pedersen interviewed Watson, an aquarist we feel you should get to know. Freshwater! 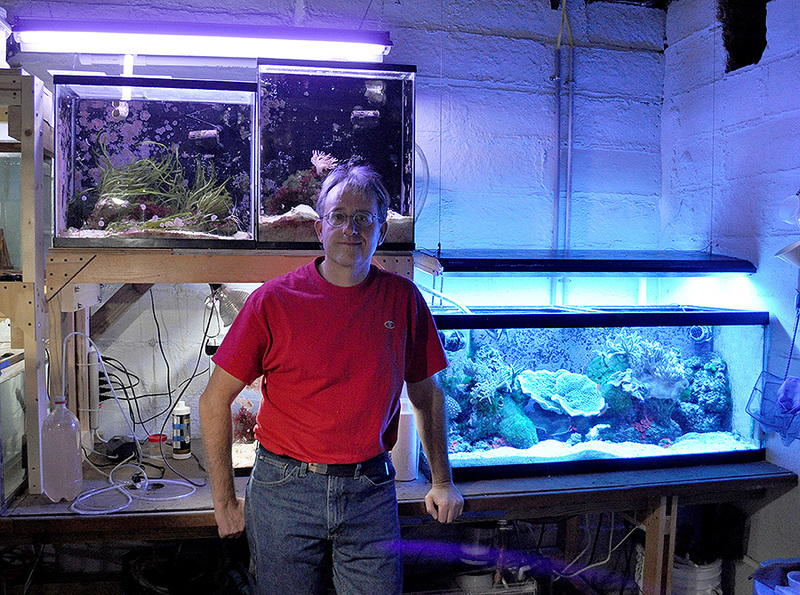 A portion of Watson’s fishroom that we don’t show you in the July/August CORAL article! Reef2Rainforest: You’re a vet by trade. How did you get your start keeping aquariums? 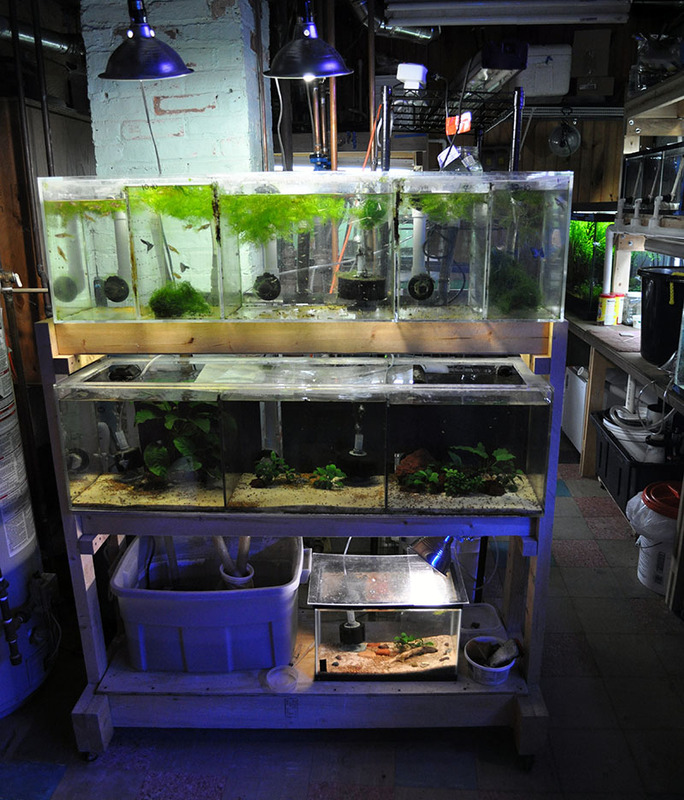 David Watson: Like many hobbyist, I started acquiring aquariums when I was a young boy. I filled my room with aquariums and always had a variety of breeding projects (fresh water) going on. I had to abandon the hobby during my college years, but picked it up again several years after starting my career as a dairy practitioner. R2R: Many aquarists first learned of you when your article on breeding Pajama Cardinalfish (Sphaeramia nematoptera) was published a few years ago. What did that accomplishment mean to you? DW: My success breeeding the Pajama Cardinalfish was an eye-opening project. I had no idea how difficult it would be. Learning about the Pajama cardinalfish’s unique reproductive biology and the techniques required to bring their larvae through to metamorphosis was both a frustrating and rewarding experience. At the time I had trouble finding much information to guide me, so when I finally succeeded, it felt like a major triumph. Watson is one of the very few private aquarists who’ve spawned and reared the Pajama Cardinalfish at home. R2R: How does your success with the Red-stripe Cardinalfish compare to your earlier success with Pajamas? DW: It was nice success given the unique way I collected the larvae. It also helped me to validate what I had learned about larvae rearing and has given me confidence to try harder species. R2R: You’ll be speaking at the Marine Breeding Initiative’s 2013 Breeder’s Workshop next month. What are your expectations for this event? DW: I’m excited to be able share my story and hope it will inspire other hobbyists to consider tackling the challenges of breeding other cardinalfishes. With over 300 species in the cardinalfish family and only a handful being successfully bred in captivity, there is a lot of opportunity for hobbyist. R2R: How do you see your role in the aquarium hobby or industry as a private, hobby breeder? DW: I like sharing my interest in marine aquarium keeping and I think promoting our hobby is an important pursuit. The old phrase “out of sight, out of mind” comes to my mind. By sharing our love for reef creatures, we help others to stay connected to an ecosystem facing daunting pressures. Our reef tanks provide a window for people who don’t have the means to see a reef ecosystem in person. I hope more hobbyist will consider setting up and maintaining reef aquariums in public places like libraries and schools. R2R: While you’re a new contributor to CORAL Magazine this issue, you’re also an avid freshwater aquarist too. What should our AMAZONAS Magazine readers know about you? 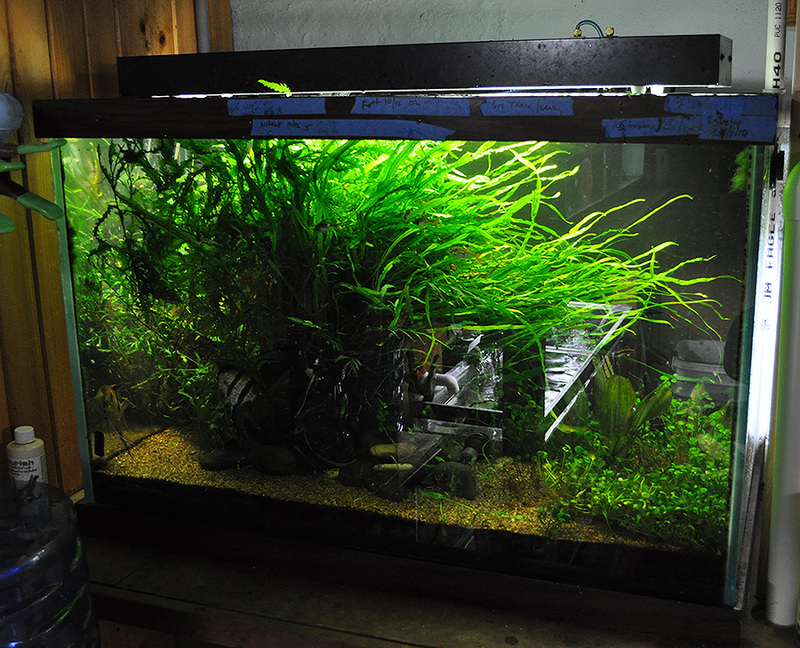 A heavily grown-in planted tank in Watson’s fishroom, as it appeared last November. 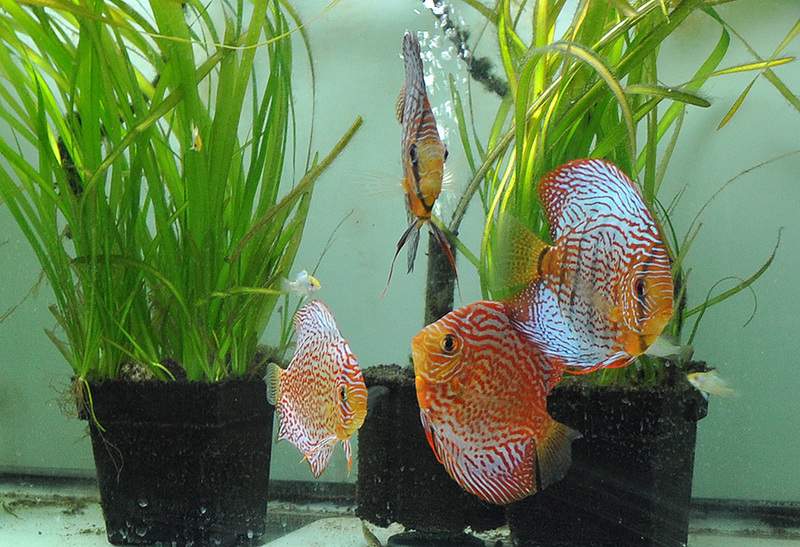 One of Watson’s less salty passions, these are some of the Discus residing in Watson’s fishroom. R2R: You don’t strike us as a breeder who keeps doing the same thing – what’s your next project (what might we be reading about next from you in CORAL or AMAZONAS)? DW: Right now I have a trio of African Pygmy Angelfish (Centropyge acanthops) starting to breed in a 30 gallon tank, so new techniques to learn and hopefully a success story to someday share. R2R: We certainly look forward to sharing any future success with breeding the African Pygmy Angelfish; best of luck David! Be sure to read Watson’s article, An unorthodox Cardinalfish breeding project, in the forthcoming July / August 2013 edition of CORAL Magazine. Watson details his triumph as one of the first people to breed Ostorhinchus margaritophorus (syn. Apogon margaritophorus). The story brings many more images, including the likely never-before-seen full larval development and settlement of the Red-stripe Cardinalfish! Don’t get CORAL Magazine? Subscribe now or find a CORAL Magazine retailer near you!